Follow That Dream has moved to tour 22, already well covered by bootleggers. This new CD marks the fourth "complete" soundboard from tour 22. There really isn't a lot to say about this concert, if you already have heard the other soundboards from this tour. Elvis performs quite adequate, he fools around less than during summer, but his mood is somewhat strained. Before this tour Elvis had lost several pounds and his physical appearance was much better than earlier the same year, and certainly much better than in July / August - just some months before. Perhaps the road to a slimmer body had taken its toll and made an impact on his mood!? As for a closer look I refer to reviews of all three previously released soundboards, Chicago Beat (October 14), Bringing The House Down (October 15) and Eternal Flame (October 20). I find the version of 'One Night' to stick out a little bit. It sounds quite comitted, and 'It's Now Or Never' that follows is ok too. Otherwise it is standard fare. The Anaheim soundboard is binaural with a lot of focus on the piano. FTD has of course merged the binaural into mono, but the piano is still too much in focus and it is evident from the first second that the source is different. I guess a better "splice" would have been possible using another soundboard source. The sound quality on Minnesota Moment is in general quite good, though perhaps a little below the bootleg releases. However, FTD has made ONE BIG MASTERING ERROR on the bonus tracks. The binaural tracks; 'Hawaiian Wedding Song', 'Blue Christmas' and 'That's All Right' comes in inverted sound, giving a thin stereo image. DZJESUS!!! Invert one of the channels, and you will get the correct sound! Lene Reidel or whoever, please master the CD while using both earphones and normal speaker setup. When a channel is inverted the result is often that the bass-line get lost or reduced. Like in this case! It is not always easy to discover if you only master music using headphones! But it is very evident on a normal speaker setup with a real bass speaker. However, the sound quality - binaural - is very good on the Anaheim tracks. It would be nice to have this soundboard in complete form sometime. This new release delivers what one could expect. 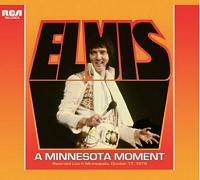 A good sounding soundboard from a concert displaying a coherent and rather focused Elvis. There is nothing magnificent or extraordinary about it, and the highlights are few and far between. And there is little remarkable about it; in that respect the Summer shows are in general more interesting.